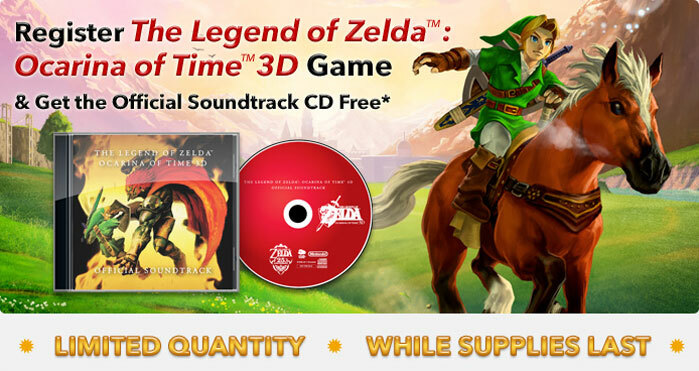 Alright, so technically they’ve been coming for a while now, but today is the day for many people to get their complimentary Club Nintendo Ocarina of Time 3D Official Soundtracks. The CD comes packed with 51 tracks, and they’re all solid pieces of Ocarina music. No sound effects or anything like that. The included insert is nice; it comes with statements by Miyamoto and Kondo, as well as a list of tracks and some pretty pictures. The CD and case are not cheap; the case is an actual CD case, not a cardboard pouch or anything. Mine came with a little crack, but nothing too major. I think I can live with it. The sound quality on the CD is good; iTunes even recognized what it was when I put it in. If you’re putting it on iTunes, be careful with which version you select. I accidentally picked a Japanese version or something. So, overall, I love this CD. Especially for free. I’ll have to swap it around in my car with my David Cook CD every now and again so I can have an epic Zelda adventure on the way to school(only to run out of hearts on the boss battle…).